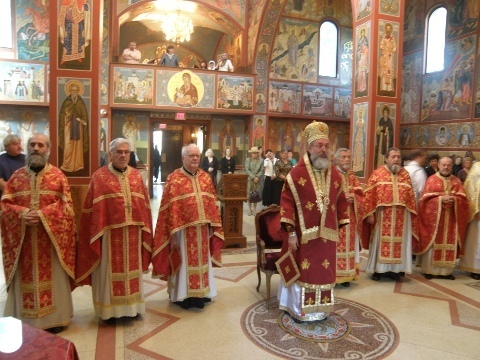 Grayslake, IL - His Grace Bishop Longin of New Gracanica-Midwestern America served the Holy Hierarchal Liturgy on Sunday, September 27, 2009, on the Elevation of the Holy Cross, at New Gracanica Monastery in Grayslake, Illinois. The bishop was accompanied by seven priests and four deacons. Following the liturgy Bishop Longin spoke in his homily of the finding and elevation of the Holy Cross by Empress Helen and Emperor Constantine in the fourth century, but he also noted the importance for each one of us of in carrying our own cross, or rather of struggling against sin, passions and anything else that might separate us from the love of God. After the sermon, Bishop Longin awarded V. Rev. Lazar Kostur with the right to wear the pectoral cross. It was on the feast of the Elevation of the Holy Cross that Prota Lazar was ordained and yesterday he celebrated the fortieth anniversary of his ordination. V. Rev. Stavrophor Lazar Kostur, was born on April 1, 1940, in Civljane, Dalmatia, to the late +Ilija and +Cvita Kostur. He came to Gary, Indiana, in 1958, where he graduated from Emerson High School. 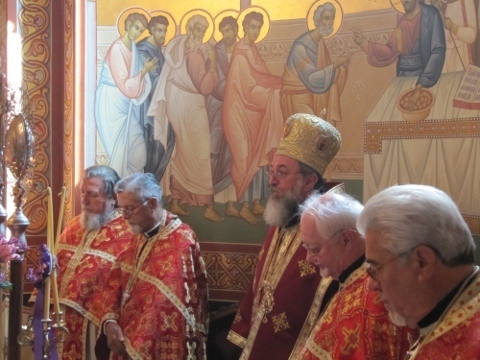 With the blessing of Metropolitan Damaskin and Bishop Nikanor of Backa, he enrolled in Holy Trinity Seminary in Jordanville, New York, under the jurisdiction of the Russian Orthodox Church Aboard. Holy Trinity Orthodox Seminary exists to serve the Russian Orthodox Church Outside Russia by preparing priests and deacons for service in the Church of Our Lord Jesus Christ. To that end, the Seminary immerses young men in the centuries old, life-giving wisdom contained in His Holy Church. Through daily participation in the Church's liturgical cycle, interaction with the life of the monastery, and study of Holy Scripture, Sacred Tradition, and the writings of the Holy Fathers, seminarians learn to acquire the mind of the Church. 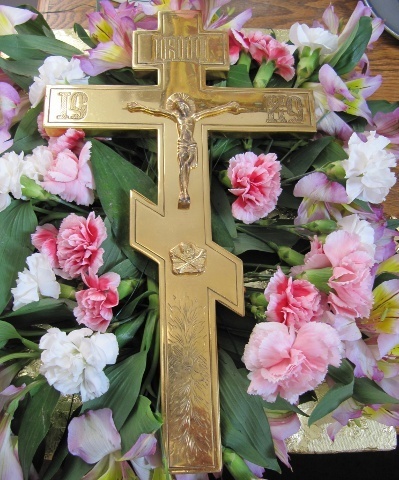 Those willing to take up their cross, struggle, and endure – by the blessings of the Most Holy Trinity – may become beacons radiating the pure and undiluted Truth of Our Saviour to a world in dire need of the Grace of God and of salvation through His love." It was during Prota Lazar's early years at the Seminary, that St. John (Maximovitch), Archbishop of Shanghai and San Francisco, visited Holy Trinity Monastery and Seminary, blessing the students. St. John bestowed his grace and abundant spiritual wealth upon the young souls. Vladika was one of the great Orthodox hierarchs of this century. He was a holy man. In him, righteousness shone. Prota Lazar today more than ever, just as all the other students, still carries St. John in his heart, praying to him for intercession before the Throne of God for strength to endure to the end. It was in 1967 that Prota Lazar graduated, receiving a Bachelor Degree in Theology from University of the State of New York. Entertaining postgraduate studies in Russian and History at Indiana University Northwest, he further pursued a Master of Arts Degree in History at Roosevelt University in Chicago, Illinois. On June 8, l969, he was united in marriage with Mira Stepanovich. On the Feast of the Exaltation of the Holy Cross, 14/27 September 1969, Lazar Kostur was ordained to the Holy Diaconate at the hands of the Right Reverend Bishop Dr. Firmilian (Ocokoljich), Serbian Orthodox Bishop of Midwestern America, at the St. Sava Serbian Orthodox Cathedral in Milwaukee, Wisconsin. His first parish was St. Nicholas Serbian Orthodox Church in Waukegan, Illinois, where he was ordained to the Holy Priesthood on Sunday, February 1, 1970. 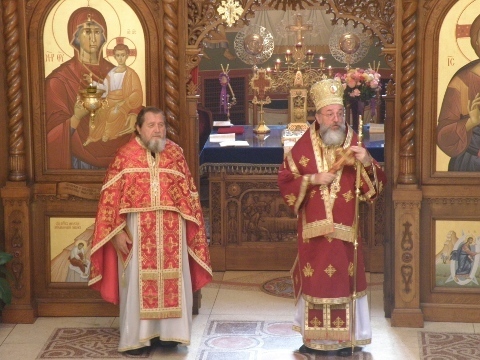 Upon the retirement of the late +Protopresbyter Stavrofor Djuro Vuckovich, Prota Lazar was transferred to serve at Sts. Peter and Paul Serbian Orthodox Church in South Bend, Indiana, on October 1, 1973. 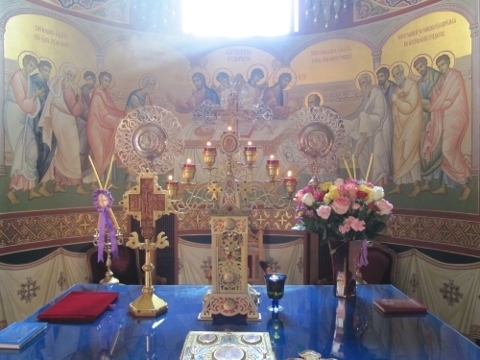 In April of l976, his work in the vineyard of the Lord continued in the Serbian Orthodox Diocese of Western America; first, at St. Sava Church in San Gabriel, and later at Holy Trinity Serbian Orthodox church in Castro Valley, California. In April of l980, he assumed the pastorate of St. George Serbian Orthodox Church in Duluth, Minnesota. Upon the retirement of Protopresbyter Stavrofor George Lazich, April 1986, the St. Elijah Cathedral Church Congregation of Merrillville, Indiana, elected Fr. Lazar to the status of permanent parish priest. On the 5th of November, 1989, he was elevated to the dignity of an Archpriest by Bishop Mitrophan (Kodic). Ordination is the Mystery in which a duly appointed man, through the laying on of hands by the bishop, receives the Grace of the Holy Spirit, strengthening him for divine service in the Church of Christ. The Mystery of Ordination is divinely established. Apostle Paul testified that the Lord Jesus Christ Himself gave some apostles; and some prophets; and some evangelists and some pastors and teachers; for the perfecting of the saints, for the work of the ministry, for the edifying of the body of Christ. During the years since his ordination, Prota Lazar, Protinica Mira, together with their five wonderful children and thirteen grandchildren, have served the Serbian Orthodox Church faithfully and with utmost dedication. He has touched the lives of his parishioners with love, patience, joy, support and spiritual guidance. He retired from full-time status last year, but continues to serve the divine services whenever possible. God grant him Many Years!